I have to admit, I do not like cold weather. Like, period. However, I do enjoy soups and stews that are hearty and help me stay warm! 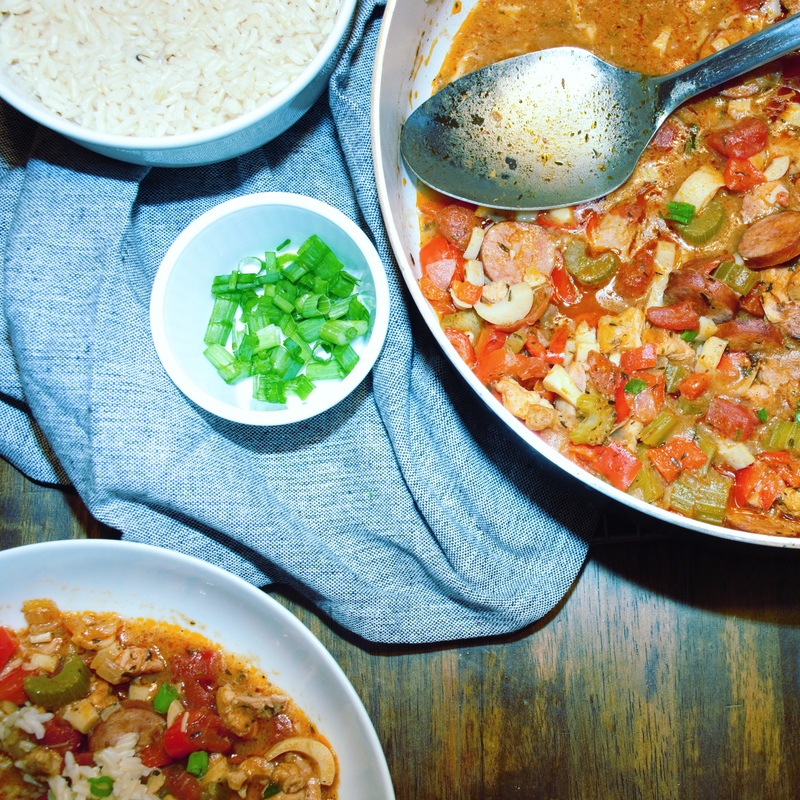 This gumbo is a spin on the traditional and very simple to make. The flavors are wonderful and I did use traditional Cajun aromatics; red bell pepper, onion and celery. I also put a can of Hearts of Palm in here. I had it in my cabinet and the texture gives a seafood-like feel. The good in this? By using turkey kielbasa, we reduce the saturated fat content. Saturated fat has negative implications on health and can contribute to heart disease. In addition to this, Hearts of Palm contain many vitamins and minerals including iron, vitamin B6 and potassium. Heat large sauté pan over medium heat with 1 T olive oil. Add chicken and sausage and cook until browned, about 5 minutes. Set aside. To same skillet, add onion, celery and bell pepper. Cook 3-5 minutes until translucent. Set vegetables aside. Melt butter in pan and add flour to form a roux. Stir for 3-5 minutes until mixture is golden brown and flour is cooked out. Add old bay, smoked paprika, thyme, and pepper and cook another minute or so. Add diced tomatoes, Hearts of Palm, chicken broth, browned meat and sautéed vegetables back to pan. Bring mixture to a boil, then reduce heat, cover and simmer for 45 minutes. Serve gumbo warm over rice.